What do the Robowranglers do the night before kickoff? Open up the shop, order some pizzas, invite a few friends over, and cut loose. So when I came into the arena after grabbing some dinner... the kids had formed a large oval on the field and were playing DuckDuckGoose. It was not what I was expecting to find. If you can dodge a ball, you can turn a wrench. Ultimate Extreme Robowrangler Dodgeball... 11 teams of 5. WHO WILL COME OUT ON TOP? Even some of the 148 mentors got involved in the dodgeball tournament. It didn't work out for us. We made a trophy! This tournament is going to be come an annual tradition. The rule is that every year the trophy will return and the defending champions will modify it with the that year's game object before presenting it to the new champions. HUGE thanks to 1296, 3310, 5431, and 7179 for visiting. I know all the Wranglers all had a blast. 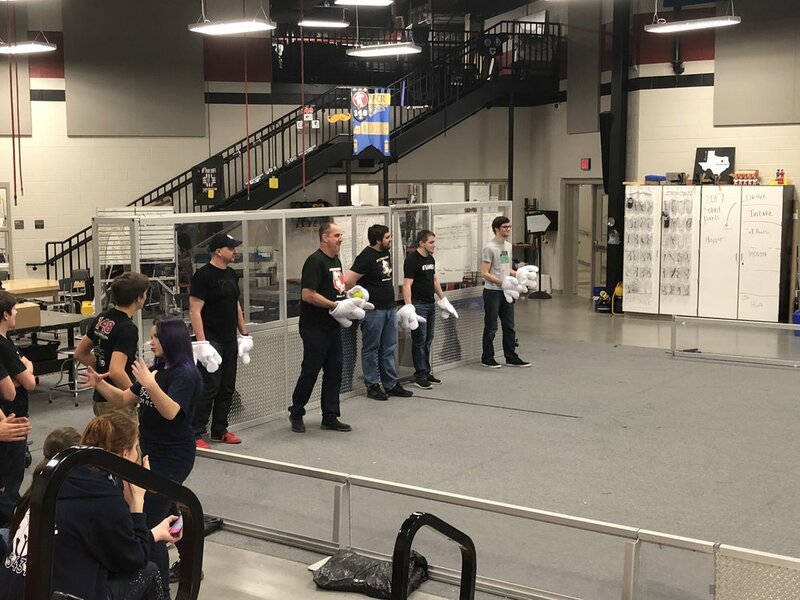 Since I guess it's time for us to build some robots, the next time they come visit hopefully we get to do some scrimmaging. (Now there are at least five teams who will be judging tomorrow's field unveil based on it's suitability as a dodgeball arena).